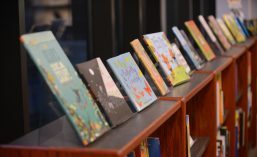 We invite local librarians and educators to use Read Local in their programming and instruction, and don’t forget to visit Butler Children’s Literature Center to see what’s new in board books, picture books, nonfiction, early readers and chapter books, middle grade fiction, and young adult fiction! We are open Monday-Thursday from 12-4 pm, or by appointment (email butler@dom.edu). However educators want to work with authors and illustrators, the important thing, Aronson reminded everyone, was that the kids and their interests and imaginations be at the forefront, and that it be a collaborative effort between all parties: “When kids meet authors and illustrators, something happens. The book comes alive.” All it takes to make this magic happen is reaching out. Many authors have contact information on their websites, and there is an online resource launching this fall that will help connect local creators with local educators (look for announcements here and on our social media!). Thanks again to Sarah, and happy collaborating to all!